With regularising familiarity, the new calendar year is coming to signify the advent of design events around the country. Starting with the Pune Design Festival moving on to UnBox, India Design ID (a.k.a. Elle Decor), the India Design Forum and Fashion Week, the stretch between January and March unleashes an avalanche of new ideas, brave propositions, exhibitions, talks and nearly endless roundtable discussions. The events can seem passive. One can end up wandering around them either as a tired spectator or an inspired design junkie, high on the adrenaline of gorgeous viewings. What a relief then to find a festival that cuts through the clutter and refuses to accept mere spectators. UnBox 2013 turned out to be a festival that delivered on the promise of true participatory celebration. For 3 days, it flowed rich with the spirit of “hands on, minds, on, hearts on” with a dense programme of workshops, labs and performances. It created so many opportunities for people to make, do, see, think, explore and discover, that it’s hard to describe the energy of the Festival. So for a change, I won’t. I had the chance to be part of a unique lab at UnBox called the Zine Press. Mentored by legendary Teal Triggs, the zine team was tasked with documenting the Festival through all our varied media and bringing it all together into a single publication. It was a hectic job and took all of our skills as writers, illustrators and designers, but we delivered the zine in 3 days flat. With its fold-outs and little interactive pages hidden inside, the printed edition is a pretty nifty piece of work, but if you can’t get your hands on one, here’s a digital version to share the spirit of UnBox 2013. 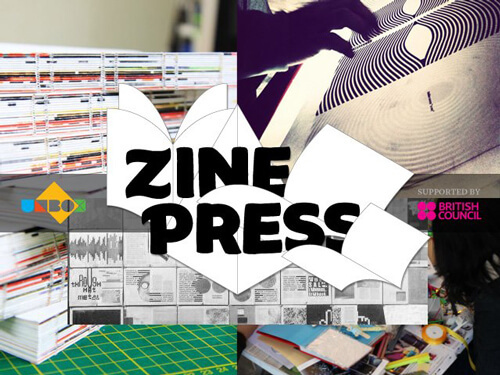 The Zine Press blog is available online along with details about the team. Do check it out for entries by participants of the Writing for Design workshop held over 2 days of the Festival.